With ongoing run and maintenance costs going into the millions, the importance of efficiency and safety is at the heart of operations within the oil and gas industry. Product failures and lengthy start-up times incur unacceptable downtime and operational losses. 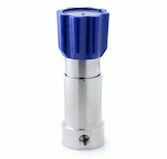 The role of the pressure regulator is critical and to run an operation in this sector efficiently means demanding exceptional performance and reliability, backed up by superior quality in design and production. 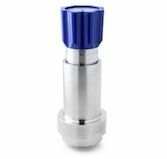 With increasing demand to reduce costs, hydraulic control systems now tend to eliminate bypass valves and use the hydraulic pressure regulators to fill the long umbilical lines with high pressure water glycol media. With umbilicals being several kilometres in length, this can be a slow process due to the typically low flow capacity of the pressure regulator, and can cause damage to the regulator if excessive flow rates with high differential pressures pass through the unit. Our pressure regulators fit the brief. 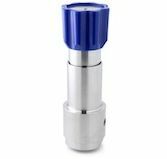 We cover pressure control up to 1,380bar (20,000psi) and models such as our LF690-03 quick fill regulator allow flow rates up to 40lpm whilst ensuring stable pressure control, even with 830bar (12,000psi) differential pressure. By minimising start-up costs, maximising efficiency and reducing downtime, our LF690-03 offers a solution to this potentially expensive problem.